In recent years, more and more beauty enthusiasts have begun praising castor oil as a natural solution for hair growth. An age-old remedy long used in traditional medicine, castor oil is also said to moisturize the scalp, ease dandruff, and leave your hair smooth and shiny. Sourced from the castor bean (Ricinus communis), castor oil is rich in ricinoleic acid—a type of fatty acid found to fight inflammation. When applied to the scalp, it’s purported to enhance the health of the hair follicles and, in turn, promote hair growth (as well as protect against hair loss). As castor oil gains popularity in the natural beauty world, proponents suggest that the use of oil can dramatically increase the rate of hair growth. Some even claim that monthly application of the oil can boost hair growth by up to five times the usual rate. Despite these claims, however, there’s currently no scientific evidence to show that castor oil can promote hair growth. Furthermore, there’s a lack of recent research testing castor oil’s effects on any type of hair-related issue. Still, some older research (including a study published in the Journal of Cosmetic Science in 2003) indicates that castor oil may improve the appearance of hair by increasing its luster. If you’re interested in using castor oil for hair growth, try rubbing just a few drops of the oil into your scalp. You can also massage a few additional drops of castor oil into your hair’s midsection and ends, which may protect against breakage and improve hair texture. Although the ideal timing for castor-oil-based hair masks is unknown, letting the oil sit for about two hours may be beneficial. To prevent oil drippings from staining your clothing and other items, consider covering your head with a shower cap until it’s time to wash your hair. Many hair care experts recommend using castor oil no more than once a week. When used more frequently, castor oil can cause buildup and lead to issues like matting. Because castor oil is extremely heavy and often difficult to remove from hair, hair treatment recipes typically call for diluting it with other plant-derived oils (such as coconut or jojoba). Combining oils can also tone down the scent of castor oil, which many people find unpleasant. Proponents of castor oil often recommend opting for organic, cold-pressed products. It’s said that cold-pressed oils are higher-quality and more nutrient-rich than those processed at greater temperatures. When it comes to using castor oil as a hair treatment, one of the most popular varieties is Jamaican black castor oil. Made with roasted castor beans (and the ash produced by the roasting process), Jamaican black castor oil is said to be especially beneficial to those with thick, dry, and/or coarse hair. There’s some concern that using castor oil as a hair treatment may lead to acute hair felting—a rare disorder in which the hair becomes entangled into a hard mass. Since the condition is irreversible, the only solution is to cut off the affected hair. Since castor oil can cause stains, it’s best to wear an old t-shirt (or any item of clothing you don’t mind staining) when using castor oil on your hair. Castor oil can also stain towels, so make sure that your hair is thoroughly washed prior to towel-drying. Keep in mind that your hair may require two applications of shampoo in order to completely remove the castor oil. If you’re thinking of using castor oil as a remedy for hair loss, remember that hair loss may be the sign of an underlying health problem. Therefore, it’s crucial to talk to your doctor as soon as possible if you’re experiencing unexplained hair loss. Maduri, V., Vedachalam, A. and Kiruthika, S. (2017). 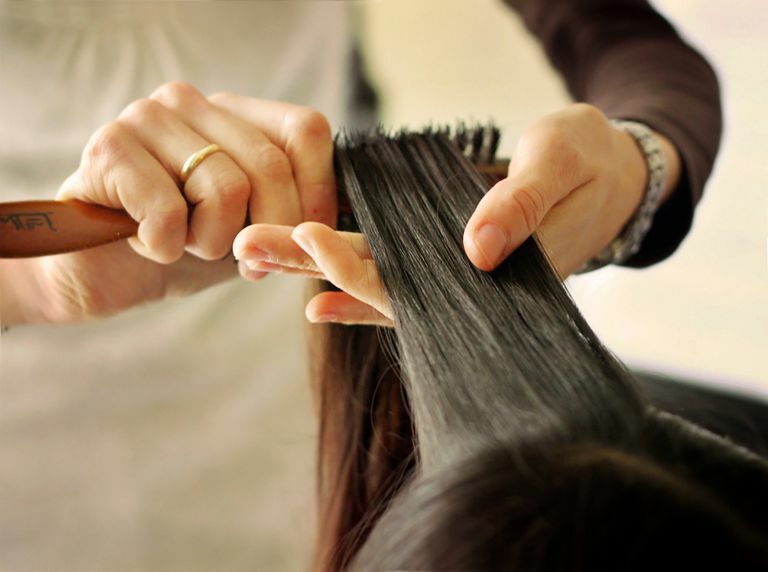 “Castor Oil” – The culprit of acute hair felting. International Journal of Trichology, 9(3), p.116. McMullen R., Jachowicz J. (2003). Optical properties of hair: effect of treatments on luster as quantified by image analysis. Journal of Cosmetic Sciences, 54(4), p. 335-51.